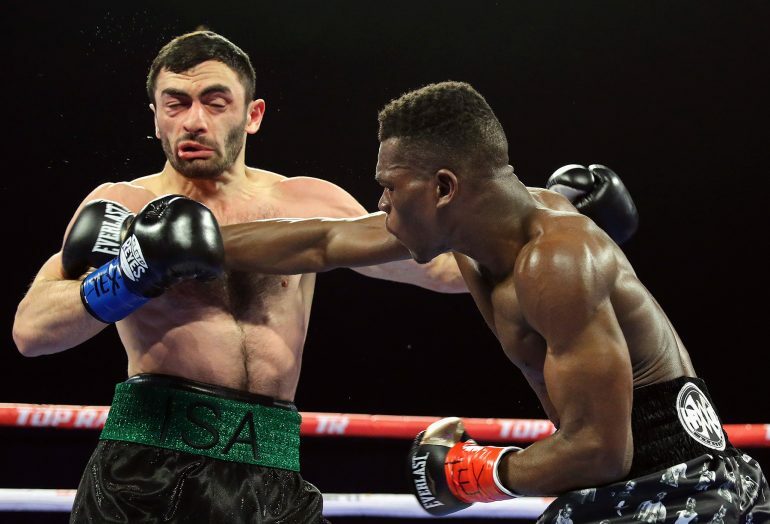 Richard Commey knew that a victory would not only net him his first world title, but also a lucrative meeting with Vasiliy Lomachenko. There was some consternation heading into Saturday’s title tilt that April 12 might be a quick turnaround for the victor. Commey ensured that wouldn’t be an issue — at least on the surface (but more on that later). He walked through Isa Chaniev in a fight televised by ESPN and stopped his foe after depositing him three times on the canvas. Referee Laurence Cole halted the contest at 39 seconds of Round 2 and now, Commey will look forward to the biggest fight of his career: a meeting with the pound-for-pound best fighter in the world. First, Commey will undergo an X-Ray on his right hand. 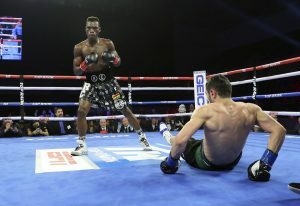 The Ghanaian told reporters at ringside he felt a knuckle pop on the punch that caused a knockdown in the opening round. If he’s clear to fight in two months, he’ll meet Lomachenko at Staples Center in a fight streamed on ESPN+. Commey (28-2, 25 knockouts) stood toe-to-toe with Chaniev at the opening bell. They exchanged shots on the inside, and it was Commey’s heavier hands that were more effective. Chaniev (13-2, 6 KOs) was floored in Round 1, and when he rose, he was clearly on unsteady legs. A left hand blasted Chaniev, 26, early in Round 2 to produce a second knockdown. Moments later, Commey, 31, pounced and banged the Russian with a left uppercut, right hand combination that ended matters. Commey’s only two pro defeats both came in 2016, and many media members believed he deserved the nod in each fight. First, he dropped a split decision to Robert Easter in his only other bid for a title. Next up was Denis Shafikov, who outpoined him in the same manner. Lomachenko is rated No. 1 by The Ring pound-for-pound, but he’s best suited for 126 pounds. Commey, a physical specimen, will enjoy a considerable size advantage. It shapes up as a tough challenge for the two-time Olympic gold medalist. “That’s one guy who is very, very competitive with Lomachenko,” Arum said. “He hits like a mule, he’s a big guy. Lomachenko will embrace this kind of challenge. It’s a challenge fighting a guy who can really hurt you. … That’s what he wants. There’s no doubting Loma’s marvelous ring skills, but he’s displayed some vulnerability in his two fights at 135 pounds. Commey said he’s “never really thought about” Lomachenko, but assuming he’s medically cleared, he’ll need shift his focus in a hurry.